As promised, I’m sharing a few more shots from my shoot up at the northern tip of New Hampshire…known as the Great North Woods Region in Coos County. 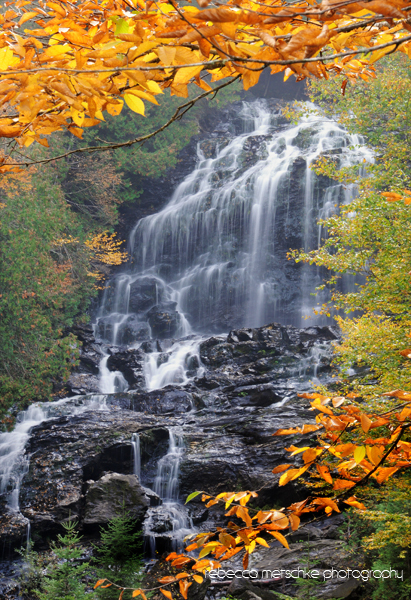 One of the most beautiful waterfalls in the state is located just north of the town of Colebrook. My husband and I discovered it a number of years ago as we were meandering through the region on the way to Quebec; it’s remained my favorite. I’ve not photographed the falls in autumn previously so it was high on my shot list. That said, I still had to work for this shot. The unusually warm temperatures contributed to the development of dense fog overnight; nothing was visible at daybreak and for quite some time afterward. The problem? With sunny skies forecast for the day, the only time to work at this location was early morning – before the sun poked its head out from behind the falls – when there’d be nice, flat light. As the clock kept ticking, I wondered if I’d have any opportunity to shoot. 7am became 8am…then it was nearly 9am. I needed the fog to burn off, but not too much since the sun was now becoming visible and was already quite high in the sky. In the end, I had about 15 minutes to work before BOOM that was it. Sun. Lots of shadows. WAY too much contrast. Fortunately, I got something for my effort.